Bespoke steel planters were commissioned for No. 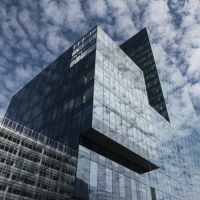 1 Spinningfields – Manchester’s tallest commercial office building, at the heart of the world-class, 26-acre Spinningfields development masterplan. The planters were manufactured from 2.0mm thick Zintec Steel, with a Polyester Powder Coated [PPC] finish to RAL 9007 [Grey aluminium]. The scheme comprised a selection of planters, from L 2000 x W 2000 x H 1000mm tree planters, to shrub planters up to L 4400 x W 1200 x H 1000mm. IOTA’s planters were commissioned for No. 1 Spinningfields by principal contractors, BAM Construction.